In 2015, a record 4 million people visited Yellowstone National Park, many of them drawn by the opportunity to witness the eruption of the most predictable geothermal geyser on earth, Old Faithful. After the geyser erupted, most of those onlookers then walked down the boardwalk toward another landmark that has moved the imaginations of millions since 1904 — the Old Faithful Inn. 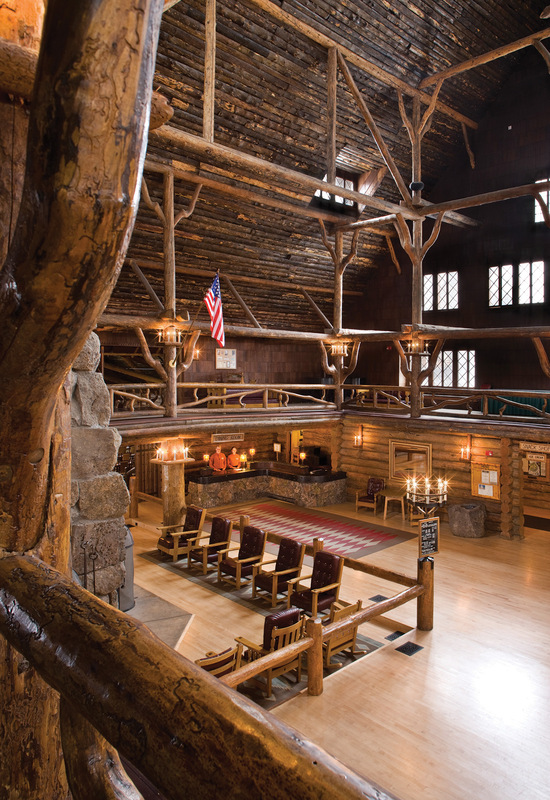 Sited to take advantage of views of the geyser, the inn — with its distinctive, seven-story lobby and massive stone fireplace — was the first rustic park lodge built in the United States. While standing in what is arguably the country’s most famous lodge, it’s impossible not to wonder what architect Robert C. Reamer (1873–1938) initially thought when approaching this project. What type of structure could possibly exist next to one of nature’s most impressive displays? How does man leave his mark amid such natural beauty? Reamer concluded that the inn needed to capture the frontier spirit that brought so many people to the park in the first place. At age 29, he designed a building that reflected its surroundings; and in the process, he popularized a movement that has resonated with many architects ever since. Prior to the Old Faithful Inn, hotels in national parks looked like they belonged in cities; they were “islands of civilization in the frightful wilderness,” according to the National Park Service. Most were Queen Anne or Stick Style buildings that could exist in any urban or rural setting; they represented people’s influence upon the landscape instead of the landscape itself. 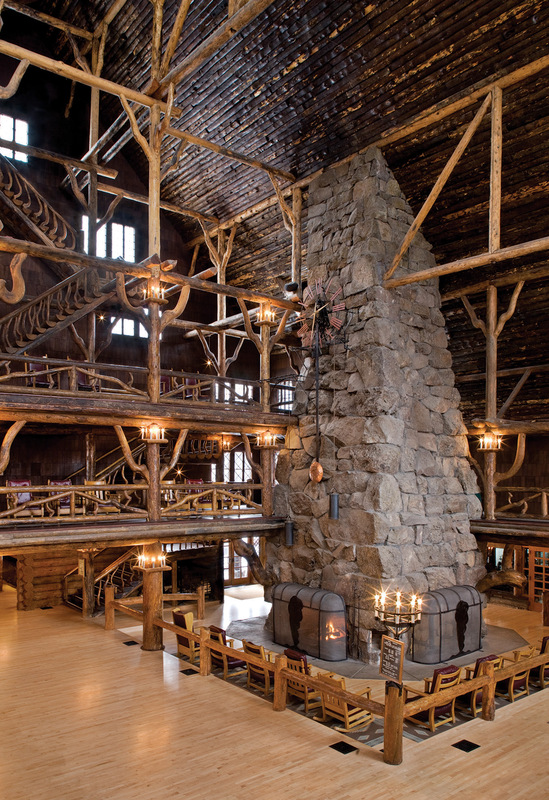 “While ‘rustic’ architecture was not a style Reamer invented, the Old Faithful Inn is what made it popular and acceptable to put that style in a big public space; and that was unheard of for the time,” said Quinn, author of the book Weaver of Dreams: The Life and Architecture of Robert C. Reamer. About 45 laborers and artisans built the inn, which is constructed of logs, shingle siding, and a rough-cut stone foundation. Using materials from the park, Reamer designed the building with proportions that stood up to the grandeur of its surroundings. There is, after all, a geyser that shoots thousands of gallons of boiling water as high as 185 feet visible from the front porch. The 76-foot-tall lobby has been compared to a tree house, with tiered platforms and staircases leading to guest rooms and other areas. 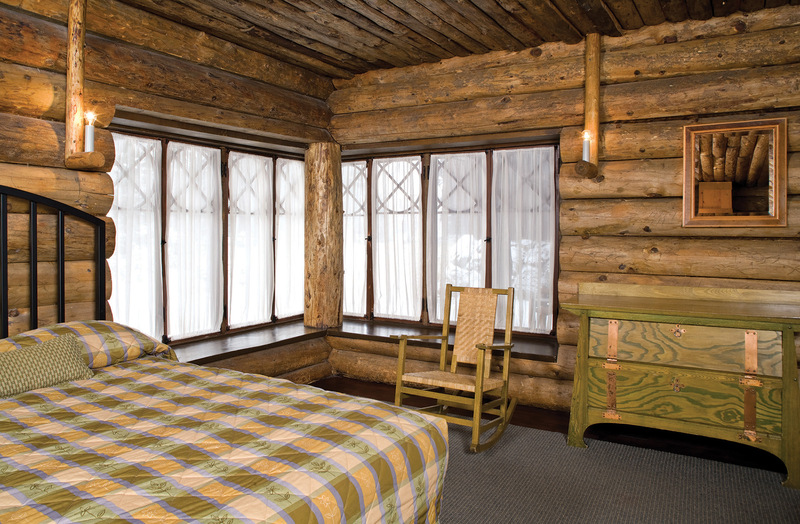 Crooked limbs of lodgepole pine were matched in sets and used to embellish windows, stairwells, and railings. The four-sided, rhyolite fireplace stretches through the roof, about 85 feet skyward, and was built with volcanic rock excavated from cliffs at Black Sand Basin in the park. This same rock — remnants from the last volcanic event in Yellowstone — was used on the base of the building’s exterior foundation as well, anchoring the inn to its site. The forward-thinking architect also designed aspects of the inn to be asymmetrical in order to reflect the chaos of nature. A patchwork of dormer windows disrupts the roofline. And throughout the inn, windows vary in size and shape, from diamonds to squares and rectangles. Tour guides have theorized that these assorted shapes filter light into the lobby like “light through a forest canopy,” according to one source. Reamer’s relationship with Yellowstone lasted for 34 years, Quinn wrote in Overcoming Obscurity: The Yellowstone Architecture of Robert C. Reamer. From 1903 to 1937, he designed more than 40 projects for the park in almost every developed area. Ten of those never made it past the proposal stage, but of those that he did see to completion, 18 are still standing. The inn’s influence on American architecture, particularly park architecture, was immeasurable. Reamer’s inn established the importance of designing buildings that harmonize with the natural environment on a large and public scale. Throughout the country, national park buildings followed this formula. And elements of “parkitecture” are found in many residential structures built today. Based in Livingston, Montana, Foote is an architect who calls himself “obsessively driven” by sensitive regionalism and the preservation movement in the U.S. A graduate of the Rhode Island School of Design and the Yale School of Architecture, for more than 50 years Foote has designed buildings that are rooted in their regional vernacular. 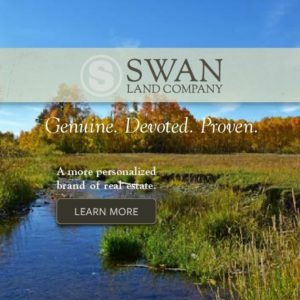 His philosophy is that our land, our history, our people, and our traditions make the Western U.S. a special place, and our architecture is the most visible manifestation of that uniqueness. The inn, Foote said, is “one of the archetypal buildings in the West.” It is “the seed pod from which — for lack of a better term — ‘dignified rustication’ took place.” There is a subtlety in regionalism that the Old Faithful Inn perfectly achieves in its materiality, the attention to hand-wrought details, and the understanding of scale as an abstract thing, not just a grand building because the landscape is big, he explained. There’s a calculated proportion that, like all great art, is something one feels. And beyond its stylistic contributions, the structure marked the beginning of an appreciation for the West for more than just its cowboy history, but for its attitude and for the people who live here as well. Kyle Tage, of the Bozeman-based Locati Architects, said that “parkitecture” aptly describes “a lot of the creations that come from not just our firm, but throughout Southwest Montana.” By this, he is referring to features like exposed structural elements and raw rock with no applied ornamentation, and the idea of the hearth as central to the home which was made famous by the inn. And isn’t that always a hallmark of timeless art or architecture: how it elicits a thought or a feeling, and how it conjures a sense of place and history? The Old Faithful Inn successfully stands as a man-made icon in the country’s first national park. It has left an impact on generations of visitors, and has inspired architectural design across the West. 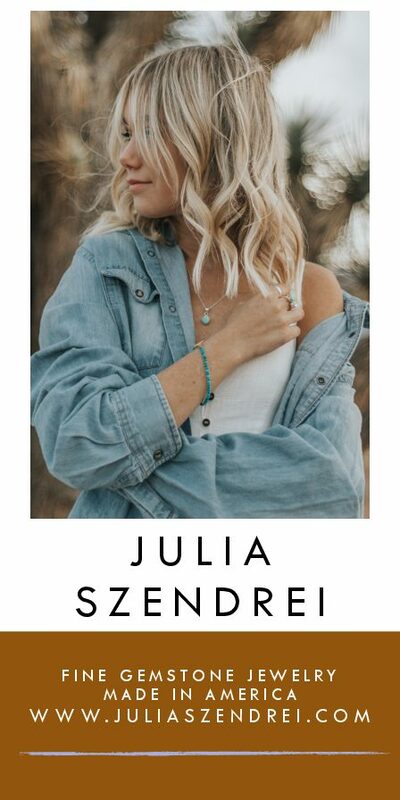 In the process, it has served as a home base for countless encounters with Yellowstone, and thus has served as the firmament for thousands, perhaps millions, of extraordinary memories. Adelaide Child designed the inn’s original interiors. Although she selected Mission-style furniture, she refused to decorate the space as a hunting lodge, avoiding animal heads and bearskin rugs. With renovations in the 1910s and 1920s, the inn now offers 327 guest rooms. They retain much of their original character and many still use original furnishings. 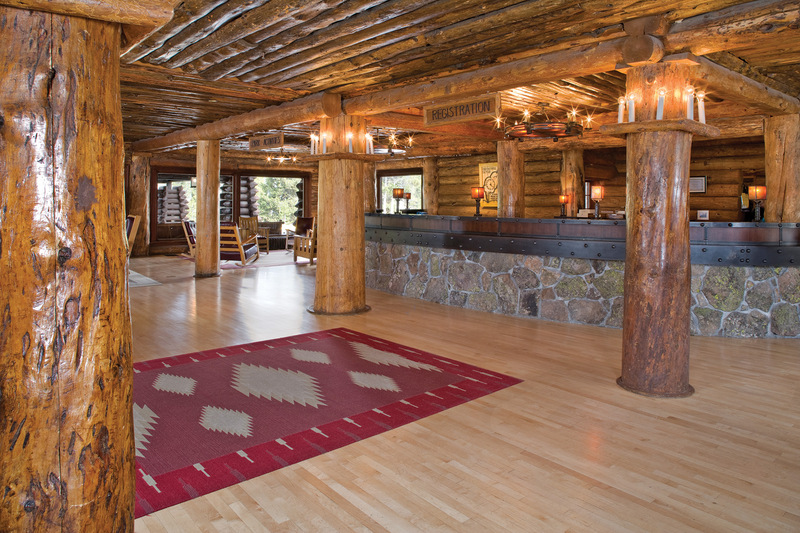 Compared to a fantasy-like treehouse, the logs in the lobby retained their bark until the 1940s. 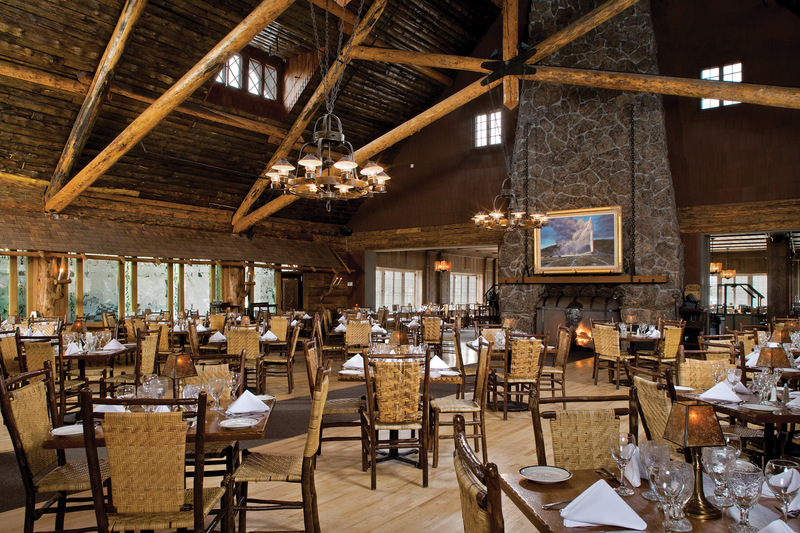 Some 500 tons of rock was used to construct the massive stone fireplace, which stands as an example of the Golden Age of rustic resort architecture. Details make the design, and electric candles contribute to the Old-World ambience. 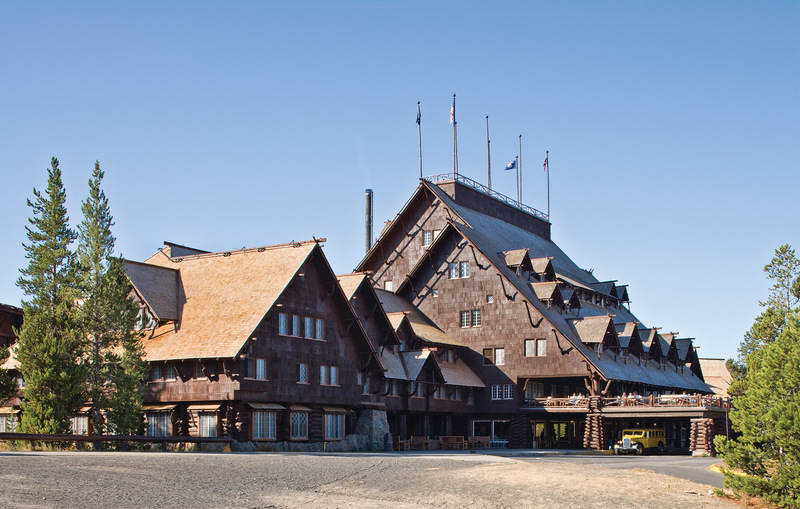 The Old Faithful Inn was designed by architect Robert C. Reamer to feel as though it had naturally sprung from the earth. The scattered dormers and alternating rooflines are meant to reflect the disorganization of nature.